Campaigners urged the UN Human Rights Council Friday to take Vietnam to task over its jailing of dozens of cyber-dissidents, claiming Hanoi was in breach of international law. 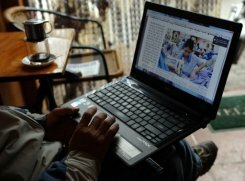 A man reads online news with his laptop at a coffee shop in downtown Hanoi on January 15, 2013. Campaigners urged the UN Human Rights Council Friday to take Vietnam to task over its jailing of dozens of cyber-dissidents, claiming Hanoi was in breach of international law. “We call upon the Council to press Vietnam to put an end to this repression,” said Vo Van Ai, speaking on behalf of Vietnamese campaigners and the International Federation of Human Rights. In a speech to the UN body — which is halfway through a monthlong session addressing a raft of global rights concerns — he said a total of 32 bloggers and other cyber-dissidents were behind bars in Vietnam, either sentenced or awaiting trial.